Today’s song, "With Hope" by Steven Curtis Chapman, reminds us of the power of hope to sustain us in our daily lives and the travails and difficulties that often accompany us. We also celebrate both All Saints’ and All Souls’ Days in the coming days when many will travel to the places of interment of their beloved departed. During these days it may be good for us to spend time reflecting on how hope, remembering the Saints and visiting our departed friends and relatives are intimately connected at this time. The Saints are those whose lives have given witness to faithfulness to God and the abundance of life that comes with that faithfulness. Their inner restlessness was oriented towards God in lives that directed them towards the Beatific Vision (immediate knowledge of God that comes with being in God’s presence in heaven). We celebrate the hope in their lives as the hope that allows us to journey forward in faithfulness to God. And it is this hope that brings us to our loved ones who have passed on. We know they were not perfect while alive, but also yearned for God. And while they have departed from this earthly life, their lives do not end as we believe in a God who promises us eternal life. And in remembering them we join with them in the eternal journey towards deeper and more meaningful faithfulness. As we celebrate All Saints' Day and All Souls' Day, we invite you to pray for the hope that animated the Saints to be present in you that you might continue the journey of our ancestors and relatives towards the fullness of life in God. Many thanks to K Summers for the video! As part of our commitment to bring you resources for praying and singing every Tuesday, we will be sharing the music from the mass setting by Alejandro D. Consolacion II in honor of St. Therese of the Child Jesus. Today we are sharing the piece "Alleluia." You may go to this link to download the high resolution PDF file of the piece. 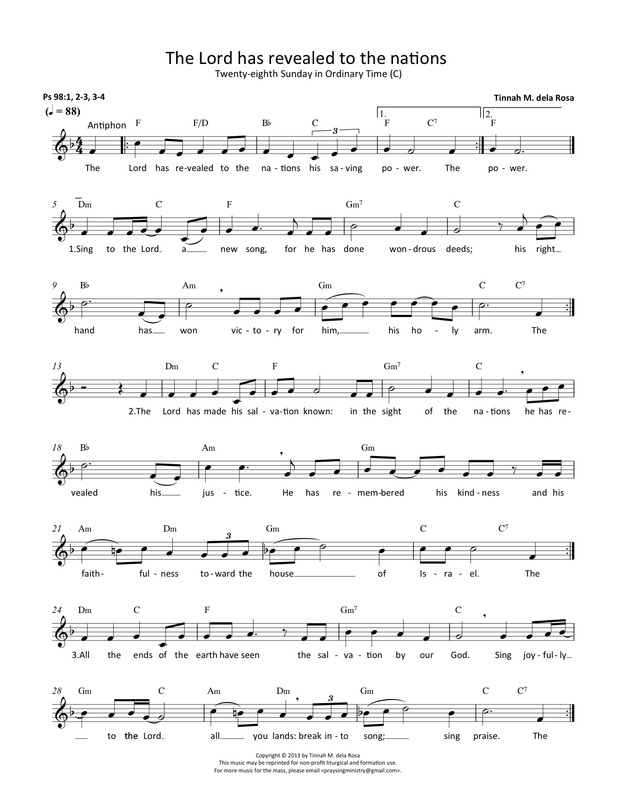 You may download the music sheet with a higher resolution here. Click here to view the readings for next Sunday (November 3, 2013) via the US Conference for Catholic Bishops website. This is a familiar line in the Scriptures, particularly when we recall the story of Job in the Old Testament. What does it really mean? The word blessed in the Hebrew language means “to kneel”, which expresses not only praise but also faith, trust, honor and reverence. Job’s story is very close to our own experiences in the modern world. How many of us have experienced days of bountiful blessings, everything going right and our way? However, there are also many among us who have experienced periods of hardship wherein even the little things are taken away or lost. Job had everything, but as the story goes, almost everything he had was eventually taken away. Everyday we read or hear various news about people - the rich getting richer, or a few sharing their rags to riches story while there are also stories about people losing loved ones, and or property due to natural or man-made disasters and crimes. But the essential question we have to ask ourselves is this, “During these times of plenty or need, are we still able to proclaim the goodness of the Lord?” Like Job, would we still be able to say, “Blessed be the name of the Lord”? We invite you to reflect and pray with the song, “Blessed Be the Name of the Lord” composed by Matt Redman and performed by Tree63. As you pray, recall moments of plenty or blessings and times of scarcity or great need with sincere adoration, trust and faith in God, Who is the source of all blessings and goodness. Have a meaningful conversation with the Lord, as you exchange blessings with Him. May you continue to be a blessing to others this Thursday and everyday. * Many thanks to Marisa Watters for this video. Today we are sharing the piece "Papuri sa Diyos," the Gloria in Filipino. You may go to this link to download the whole PDF file of the piece. You may download the music sheet with a higher resolution here. Click here to view the readings for next Sunday (October 27, 2013) via the US Conference for Catholic Bishops website. Today we take a moment to reflect on the Magnificat, Mary's hymn of praise to God, which gives us insights into Mary as a model for mission today. The first part (Luke 1:46-50) deals with what God has done to Mary, a woman of low estate. How God has acted towards Mary is typical of the way God acts towards us and all of his creation. We see here a call to justice – to be like our Father and his Son who have a preference for the poor. By calling herself a lowly servant of God, Mary has really participated in the brokenness of the people of her times. We too are called to participate in the brokenness of the oppressed, the marginalized and the needy. The second part (Luke 1:51-55) moves out from that single experience and universalizes it. God is faithful to promises, exalts the lowly, fills the hungry with good things, scatters the proud, puts down the mighty from their thrones and sends the rich away empty. This reveals a God who punishes injustices and corrects the situation of the oppressed. He reverses the misleading understanding in which worldly might and wealth, however gained and maintained, are the sole determinants of one’s standing before God and one’s neighbor. As you pray with the "Magnificat" by David Haas, ask yourself: In what ways does Mary inspire me to have a preference for the poor or to act with justice in my given circumstance? Ponder on the Lord's invitation to you through this son. Speak to God about it. Many thanks to Aira Lagunza for the video. Today we are sharing the piece "Panginoon, Maawa Ka" for the Penitential Act of the mass in Filipino. The psalm settings for next Sunday is an original composition by Tinnah M. dela Rosa for PraySing Ministry. 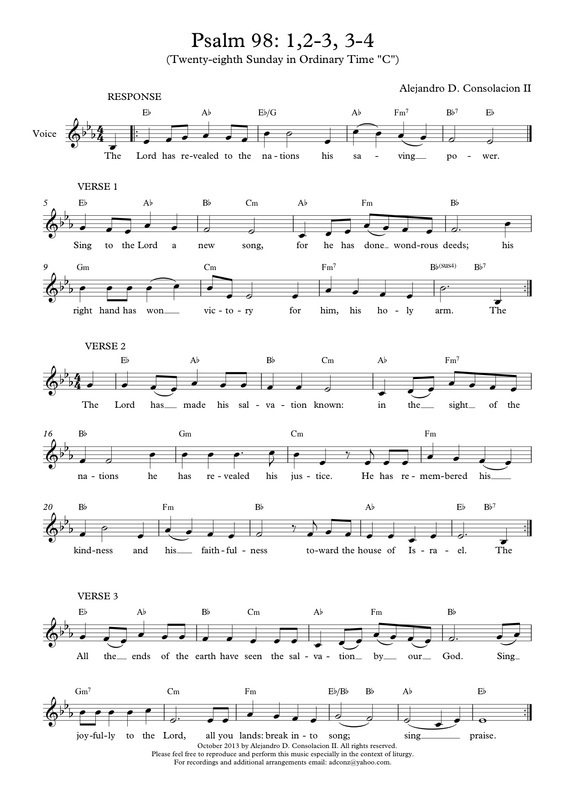 You may download the music sheet with a higher resolution here. Click here to view the readings for next Sunday (October 20, 2013) via the US Conference for Catholic Bishops website. Have you ever been at a loss for words? It's not that you have nothing to say or don't know what to say. Sometimes mere words are just not enough to explain your hopes, your fears or the love in your heart. It is that way with us sometimes. Especially when faced with our God who inspires awe, whose love goes from east to west and runs as deep as it is wide. How can we not be at a loss for words? Yet we continue to invite you to spend this time in prayer. This time, be still and invite the Lord to listen to your heart and your deepest longings. If it helps, you may also pray with the song, "Listen to Our Hearts" composed by Steven Curtis Chapman and performed by Geoff Moore. Let your stillness to let God in be your prayer today. A wonderful Thursday to you! Many thanks to George Feger for the video! Today we are sharing the song "Glorify God by your life," a song in the Gaudium Mass CD and songbook by Tinnah M. dela Rosa and performed live by Kilyawan Consortium of Voices and PraySing Ministry Chorale. This closing song captures the missioning at the end of the mass by enjoining the congregation in recalling all that has been offered and given to them during the mass, and committing to go forth to share these gifts with the world in order to truly glorify God! Lear more about the Gaudium Mass songs here. Visit our outlets to purchase a copy of the Gaudium Mass songbook and CD. The psalm settings for next Sunday are original compositions by Alejandro D. Consolacion II and Tinnah M. dela Rosa for PraySing Ministry. You may download Alejandro D. Consolacion II's music sheet with a higher resolution here. You may download Tinnah M. dela Rosa's music sheet with a higher resolution here. Click here to view the readings for next Sunday (October 13, 2013) via the US Conference for Catholic Bishops website. As we celebrate the month of the Holy Rosary, let us continue to offer our prayers to the Lord and through the intercession of the Blessed Mother, Virgin Mary, Queen of Peace. We come to our Blessed Mother, though sinful and sorrowful yet with great faith and trust that Jesus hears us and answers our prayers even if we may not fully understand how things will unfold, as Mary, herself has experienced. God answers our prayers though it may be in the most unexpected way. Let the song, “Memorare” performed by Danielle Rose guide you in your prayer, to Jesus through Mary. You may go to this link to read the Memorare prayer. May you and your loved ones have a memorable and reflective Thursday! We just reached our first 1,000 likes yesterday! Warm greetings to PraySing Ministry's 1,000th follower, Mr. Mario Liwag. We thank all of you for supporting us on our first year! Here's to more years of praying and singing to the Lord with you! Please continue to LIKE and SHARE ours posts on www.facebook.com/praysingministry so that we can reach more people with our prayers and songs. God bless you!